Cleared by Special Counsel Robert Mueller of criminally conspiring with Russia to rig the 2016 elections, President Donald Trump went on the offensive last week, calling the chairman of the House Intelligence Committee a “pencil neck” and urging the nation’s media networks to stop allowing Trump critic Connecticut Sen. Richard Blumenthal and others to appear on TV. U.S. Rep. Jim Himes, D-4th District, who also sits on the intelligence committee, has not taken as much presidential flak as its chairman, Adam Shiff, as they both continued to press for release of the Mueller report in its entirety. 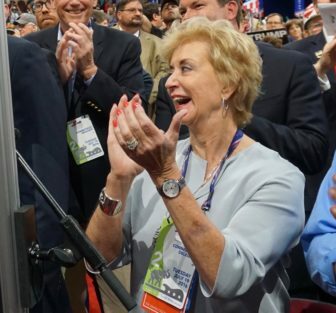 Linda McMahon applauding as Connecticut voted for Trump at the Republican National Convention. An emboldened Trump, for his part, is now gearing up his re-election bid and named Linda McMahon, Greenwich resident and head of the federal Small Business Administration, as chair of a super PAC that supports him. She announced her resignation from her government job Friday. Meanwhile, U.S. Rep. Rosa DeLauro, now head of an Appropriations subcommittee, upbraided Trump’s Education Secretary Betsy DeVos for allowing what one report identified as a waste of $1 billion on charter schools that never opened or closed due to mismanagement. The DOJ’s move was met with a legal brief in opposition prepared on behalf of Connecticut Attorney General William Tong and 20 other attorneys general who are defending the ACA. The political temperature in Connecticut was not much cooler than Washington’s as state Republican lawmakers said there would be no way they would be backing Gov. Ned Lamont’s “toll monster.” For his part, Lamont made a quick trip to Washington to get some input on tolls from U.S. Transportation Secretary Elaine Chao while legislators bickered over the validity of several votes moving the issue forward. Opponents to the governor’s Bill No. 874, which promotes the sharing of school services, turned out for Education Committee meeting. On the education front there was progress and some pain. 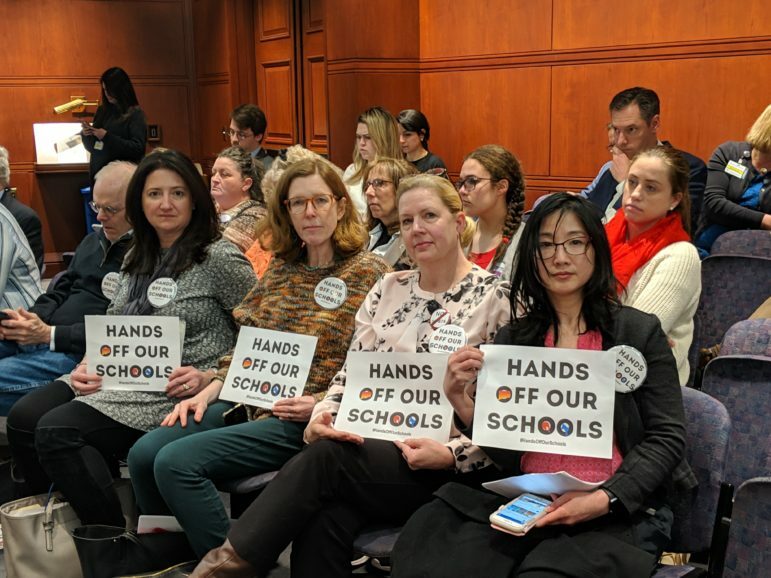 Although already watered down, the governor’s two key education bills aimed at moving districts toward regionalization advanced – but without two controversial elements. Students at the state’s four universities, meanwhile, will soon be paying 5 percent higher tuition and fees following a vote by the Board of Regents for Higher Education. Even with that, the Connecticut State Colleges and Universities will likely experience a $20 million shortfall – hence CSCU President Mark Ojakian’s now hotly contested plan to consolidate the state’s 12 community colleges. The state’s concerns about limited finances were not helped by a report that six University of Connecticut administrators, including the UConn president, have amassed some 150 vacation days in excess of normal policy limits – benefits valued at about $214,000. After a long pay freeze, the state’s assistant attorneys general will get a 5 percent increase, despite negative votes from some lawmakers who said that while they deserve the money, it’s money the state doesn’t have. One thing that would produce a lot of revenue – albeit with some potentially negative side effects – would be the legalization of recreational marijuana, an idea that advanced in the legislature last week. Phone calls prisoners make to their families are a profit center for the state, it turns out, (they generated about $7 million in 2018) though advocates for a bill to make the calls free say it is a damaging impact on inmates families who are ill-equipped to pay. Another item moving ahead was a measure to ban deceptive practices by Connecticut’s so-called crisis pregnancy centers – non-medical facilities set up to discourage women from seeking abortions from licensed clinics. There was much less opposition to a bill that will speed up computerization of prosecutors’ case files and also make their operations more open to inspection from the public. Paul Stern Paul has more than 40 years of reporting and editing experience at newspapers in New Jersey, Florida and Connecticut. He worked 22 years at the Hartford Courant in various editing roles including as deputy state editor, assistant editor of Northeast Magazine, and as an associate editor at Courant.com. A trained chef, he and his wife are the owner-operators of the Stone Arches Bed and Breakfast in Mansfield. It was musical chairs in Connecticut politics last week, and when the music stopped, long-time University of Connecticut Trustee Denis J. Nayden had no where to sit. Neither did the board Chairman Thomas E. Kruger. Political events challenged reality last week when the president claimed his father was born in Germany and former mayor and convicted felon Eddie Perez asked his city to forgive his corruption and return him to public office. Low-brow tweets, then high expectations. Now what…? The nation is on edge today waiting to find out what it will learn from the release of some or all of Special Counsel Robert Mueller’s report on his investigation into Russian meddling in the 2016 elections. In Connecticut the legislative sausage factory grinds on. Connecticut’s ship of state was tossed left and right last week as the governor, lawmakers and members of the public tried to navigate through the strong economic headwinds caused by huge multi-year budget deficits. Politics in Connecticut last week seemed normal compared to the Congressional testimony of Michael Cohen, President Donald Trump's former attorney.